The bill frees up bond money for COA. It’s time to extend a high five to state Sen. Bob Steinburg and Rep. Bobby Hanig for two bills they shepherded all the way to Gov.Cooper’s desk in the opening days of the 2019 General Assembly session. To many of our readers, the potential importance of the passage of H19 in the N.C. House of Representatives, and its companion bill in the Senate, S6, likely went unnoticed. We hope the bill is the first small step in repairing what had become a contentious relationship between our state representatives and local boards, interest groups and even large segments of the region’s constituency. The bill allows College of The Albemarle to use $1.5 million of state bond funds toward construction of a new Dare County campus for the regional community college. The funds were part of the Connect NC Bond project, which was approved by voters in a 2016 statewide referendum. As the bond project was being put together, state community colleges were asked by local legislators to put in their requests. Included in the COA request were funds for new facilities in Currituck and Dare counties. The new buildings were to be constructed with a combination of local funds and Connect NC Bond money. And quite unexpectedly, things began to go awry. Dare’s house representative, Beverly Boswell (R), expressed opposition to the way Dare and COA proposed to construct and lease the facility, claiming it violated her interpretation of state bond fund rules. 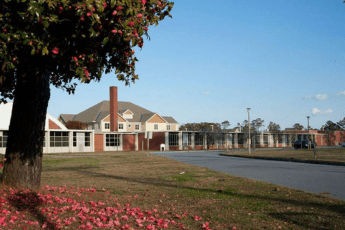 In the past, COA had used bond funds in the same manner to expand their Elizabeth City campus, and north of the Wright Memorial Bridge, Currituck County’s Board of Commissioners and then-Rep. Steinburg (R) were in accord on a plan that basically mirrored Dare’s proposal. Our state senator at the time, Bill Cook (R), took cover behind the state’s Local Act procedures — bills that pass the General Assembly granting local governments added authority to conduct business under specific state laws. A tradition under the Local Act umbrella is that the legislators representing the districts must support the legislation in order for it to be introduced to the state Senate. Boswell’s opposition to how Dare County planned to build and operate the new campus provided Cook the cover he needed to allow Boswell to block COA using funds in Dare, while Rep. Steinburg’s support for the Currituck portion of the COA spending plan green-lighted that project to move forward with Cook’s backing. Local Republicans told the Voice at the time that they felt Cook could have easily persuaded Boswell to change her mind, indicating to them that Cook was extending more than a traditional courtesy to Boswell. They believed Cook supported Boswell’s opposition to the Dare Country-COA plan for the new campus. The COA-Dare contretemps was just one of many differences of opinions that occurred between Cook and Boswell and the local governments they represented. During the tenures of both, the duo opposed their fellow Republican commissioners on numerous issues that often boiled down to ideology or influence from special interests. A few of those issues included differences of opinion over the repeal of the local ban on plastic bags in retail stores, offshore drilling, seismic testing, fracking, wind and solar farms, redirection of tax funds designated for beach nourishment to dredging, and even the continued funding for the position of an administrator at Jeannette’s Pier. The gulf established between the two legislators and local boards led to unprecedented events, such as county and town governing boards passing resolutions opposing bills and actions taken by their state legislators. Business organizations such as the Chamber of Commerce also found themselves passing resolutions opposing initiatives by Cook and Boswell. Even then-Rep. Steinburg found himself opposing Cook, who represented Steinburg’s house district over a proposed ban on wind turbines that Cook favored and Steinburg opposed. Steinburg also opposed Cook over the plastic ban repeal. One would be hard-pressed to identify similar disagreements between local governments and their respective state representatives while Sen. Marc Basnight, or Representatives Tim Spear and Paul Tine were in public service. During those times, party differences between the boards and the state legislators were not an impediment to acting in a unified fashion where Dare and Currituck counties were concerned. We, therefore, hope the recent efforts of Hanig and Steinburg to restore funding to the COA campus signals a return to cooperation between our state legislators and local governments. The region faces numerous challenges over the next several years that transcend ideology and party. Those same challenges will draw the attention and funding from interest groups that may or may not be in the best interests of the region. When we disagree with legislators and elected officials, we don’t hesitate to say so. It’s only fair we extend kudos when they do the right thing for their districts and constituents. A state legislative team that listens to and works with local boards and local groups, even if it requires bucking the party line in Raleigh or Washington, D.C., would represent a welcome change and hopefully presages a sea change in how we’re represented in Raleigh. Bobby Hanig will be an asset to his district and beyond. He has a good head on his shoulders and his heart is in the right place. Expect to see a lot more good things from Bobby Hanig. Good point and good article. I don’t always agree with either Steinburg or Hanig, but they’re a better pair of representatives than Cook & Boswell. Can someone explain how an expanded college campus in Dare County with a cost of living above the national average will be constructive when you consider the fact that basic affordable housing is near non-existent within the county and most that will partake of the facility are financially challenged in the first place. While I appreciate the fact the college is available to those that seek to further their education and skills, I believe Senator Steinberg and Representative Hanig should work toward bringing industry outside of tourism to the Outer Banks. People and families simply can’t exist on jobs that pay $40k a year at least not in Dare County. Again, thanks for the expanded college campus, but let’s work on bringing better paying jobs to the area. If we can do that then those that use the services of COA are far more likely to stay within Dare County upon completion of their studies. COA will be bringing jobs to Dare County in the form of faculty and support staff. No, they won’t be in the top 10% income bracket, but they’re jobs nevertheless. There was a discussion several years ago in the Voice about what well paying jobs could be brought here. I don’t remember anyone having any good ideas about what those could realistically be. Off-shore oil work might be an idea, but most OBXers don’t want off-shore oil production. Dare County presents lots of challenges. Periodic hurricane evacuations and flooding make life difficult for businesses. Our infrastructure is pretty basic in terms of high speed bandwidth. What businesses do you think would fit well here? I think we’d all be glad of practical ideas! @DarkSeas the first industry that comes to mind is aviation. Another industry would be software development, AI, healthcare, solar and wind energy just to name a few. Yes Dare County has its challenges, but that doesn’t mean we can’t step outside of the 20th century and embrace opportunities that the 21st presents. We must come to terms with the fact that we can no longer depend upon tourism, commercial fishing and boat manufacturing. They were great sources of jobs and revenue forty years ago, but times have definitely changed. It’s time we raise our standards instead of settling for the status quo. If we don’t embrace the future then you can count on the fact that every student COA will educate will likely leave Dare County in search of greater opportunities elsewhere. I very much appreciate this article not only for the specific content, but in a general sense it asks that we pay attention to what’s happening with our communities and elected representatives. We should all be mindful that this is where our votes count the most and the impacts, good or bad, directly hit. Thank you Russ and journalists everywhere, some who may feel under fire these days, for the work you do. Agreed – thank you for the article! Also glad to read other’s comments, especially Carter McKay’s suggestions about industry development, thinking outside of the proverbial box and Jame’s insights.